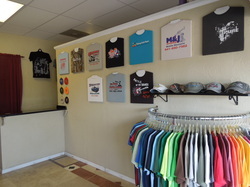 Superior Tees is a family owned and operated business located in sunny Sarasota Florida. In 2003, Dwight began screen printing shirts in his garage as a side business. In the summer of 2007, he moved the growing business to a storefront and began screen printing full time. We soon received many embroidery requests and in 2009, began to offer embroidery services to further meet our customer's needs.